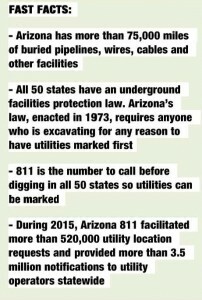 TEMPE, ARIZ. – Recognizing that buried utilities in Arizona and across the nation are jeopardized by those who don’t use the 811 system, Arizona Gov. Doug Ducey proclaimed April 2016 “Arizona Safe Digging Month.” The proclamation is among the many ways Arizona 811 is marking National Safe Digging Month this April – 30 days to remind homeowners, professional excavators and others about the importance of “knowing what’s below” all year long to prevent injuries and protect the buried infrastructure we all rely on every day. The proclamation acknowledges that protecting the public and preventing damage to underground utilities is a “shared responsibility” and promotes using the 811 system to have utility lines located in advance. Conversely, not using the 811 system can result in serious or fatal injuries, interruption of vital services and damage to the environment, the proclamation says. Contacting Arizona 811 is free and easy: Call the three-digit number, 8-1-1, at least two working days before any type of excavation begins or create a utility-location request ticket online with E-Stake. Once a ticket is created, utility operators will mark the location of their buried lines, pipes and cables in accordance with the Uniform Color Code for Utility Markings. Homeowners and other excavators can then dig safely and legally around the paint or flags on the ground, using only hand-tools when within 24 inches of the marks. Joining 811 Centers nationwide in sponsoring the popular online game “ Can You Dig It?” with more than $7,500 in prizes, while educating players about safe, legal excavation. Anyone can play once a day, every day in April, at safedigging.me. Sponsoring the annual Tempe Arbor Day 5K and Arizona 811 Fun Run on Friday April 29 at Kiwanis Park, 6111 S. All America Way, Tempe. For the first time, runners and walkers can take part in the .811-mile Fun Run. Arizona 811 will have a booth with free activities and educational information and provide a free water bottle to all walkers and runners. The event benefits nonprofit Trees for Tempe. ARIZONA BLUE STAKE IS NOW ARIZONA 811. KNOW WHAT’S BELOW. CALL 811 OR CLICK ARIZONA811.COM BEFORE YOU DIG.